Several months ago I bought some coconut flour to try in my gluten free baking. I had heard that it worked well and I was excited to experiment with a new gluten free flour. However, now that I have tried it, I am not impressed. It seems to give things an odd taste and texture. I made some muffins yesterday using coconut flour and there were some of the worst gluten free muffins that I have made. They ended up in the trash they were that bad. So, now I am wondering if it is just my family that does not like coconut flour? Has anyone else had problems with coconut flour? Does it work for some things and not for others? I would love to hear your thoughts on coconut flour? I’ve only used it a couple of times. You can’t use it alone. It was only about 1/4 of the flour mix in the recipes. Also, it absorbs liquids like crazy so you have to add more liquid if you’re subbing it in another recipe that uses different flours that are not as absorbent. I’d look for recipes that actually call for it rather than trying to use it in recipes that don’t call for it. Check out the Spunky Coconut. She uses a lot of it and maybe, by looking at the combinations she uses in her recipes, you can figure it out. The muffin recipe I used actually did call for it which was why I was surprised they turned out so bad. My husband said they were one of the worst gf things I have made, so maybe it was just a bad recipe. I will have to check out the spunky coconut, thanks for mentioning it. I really do want to figure out how and what to use it in because I know it is a healthy gf flour to use. 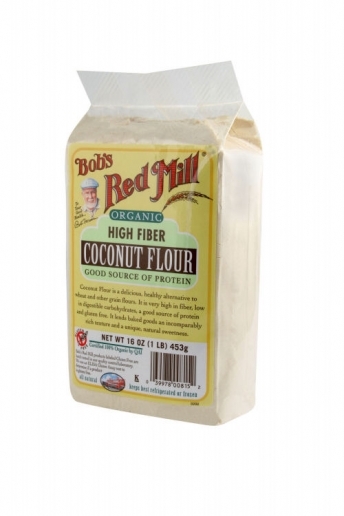 I love using coconut flour, but I don’t use it as a direct replacement for other flours in recipes. I have to completely change recipes or use recipes that are already made for using coconut flour. It really is a very healthy flour. I prefer not to use a lot of carbs or starches, which are the main ingredients in most gluten free baking. Instead, I try to bake with blanched almond flour and/or coconut flour most of the time. The Spunky Coconut and Elana’s Pantry are both very good blogs containing lots of instruction and recipes using these flours. Thanks I will have to check out those sites. I can’t use almond flour because of my daughter’s nut allergy and it seems like a lot of recipes call for both nut flours and coconut flours. But I will check out those sites for more information. I really would like to figure out the best way to use coconut flour because I know it is a healthier gf flour. Coconut flour is very absorbent. If you use it as the sole flour in a recipe you have to increase the liquids and use A LOT of eggs. There are so many other wonderful GF flour alternatives out there, that I gave up on using it. I will occasionally throw a little bit in when making granola or use it in my raw pie crusts, but I don’t use it to bake with anymore. I’ve tried it a couple times (in recipes that required it, I was not just making up a recipe) and I wasn’t impressed either. It’s not cheap, so it was a big disappointment. I am guessing it would be okay in really small quantities, but then, what’s really the point? Lynn, as others have already commented, coconut flour is to be used “with” other flours, not to be 100% replaced by it. Also, it absorbs any liquids your recipe calls for, so that has to be compensated for, too. The “usual” use for the coconut flour is 1/4 cup for every 3 cups of flour and to increase the liquid your recipe already calls for by that same 1/4 cup. When used properly, coconut flour really does impart a great coconut taste. It is not a heavy flavor but enough that you know there is some “other” flavor lingering in the background! You may have picked up an expired package or perhaps even a “bad” package of the flour or it was incorrectly used in the recipe. Which ever it was, don’t give up on it just yet, especially if you like coconut. One thing I’ve been using it in now for quite some time — and, my family now prefers these made with the coconut flour or don’t make them at all! — is in chocolate chip cookies! I add 1/4 cup of the coconut flour to the recipe and reduce the other flour by the same amount. You can then add water, milk or cream to make up for the liquid. These chocolate chip cookies taste like the Pepperidge Farms “Sausalito” choco chip cookies, and the texture is just about the same! Another way we have used this flour is for “breading” or dredging, especially shrimp or chicken. You can either make a batter with it, dip and coat then deep fry it, or, mix the coconut flour into your gf bread crumbs (or other flour) then dredge your shrimp or chicken, then bake. This makes for a great “sweet and sour” (chicken) dish, where pineapple, green pepper strips, etc., are also added to the baking dish. Give it another chance! And do visit the two sites mentioned above. I think you will eventually come to truly enjoy the fresh flavor it gives your baked goods and other recipes! Thank you for the information! I had not thought to try a little in cookies. I am going to try that. And I will try it in coatings also. I have not given up, but will not be using it all on it’s own again. I really like using it, we just have a TON of it and only so many recipes to try! And I second the Spunky Coconut site. I tweaked one of her recipes and it was SO good. I’ve posted several on my blog and if you can use eggs (which we can’t) it makes all the difference. The recipes I’ve seen call for a crazy amount of eggs, too. I, too, will be checking out Spunky Coconut!